IBA guides the delivery of its outputs through its governance and policy framework. This framework comprises IBA’s enabling legislation, other statutes and government policies, the Board and Management team, strategies, plans, policies and procedures. The Board is appointed by and accountable to the Minister for Indigenous Affairs. Under the Aboriginal and Torres Strait Islander (ATSI) Act 2005 the IBA Board are required to prepare a Corporate Plan that sets out a statement of IBA’s objectives and outlines the strategies and practices that the Board intends to adopt to achieve those objectives. Three Board Committees – the Audit Committee, the Finance and Investment Committee, and the Remuneration and Nomination Committee – assist the Board. In accordance with section 168 of the ATSI Act, the Board appoints a Chief Executive Officer who manages the day-to-day administration of IBA. The Chief Executive Officer is supported by an Executive Management Team, Management Committees and staff. 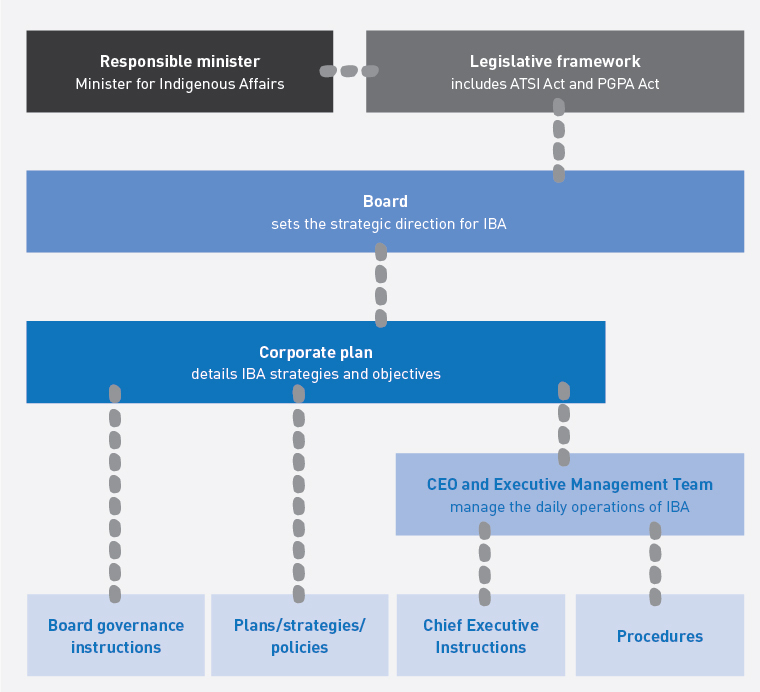 The following flow chart illustrates the governance and policy framework under which IBA operates.